May I, with some trepidation, offer the attached puzzle for your entertainment? 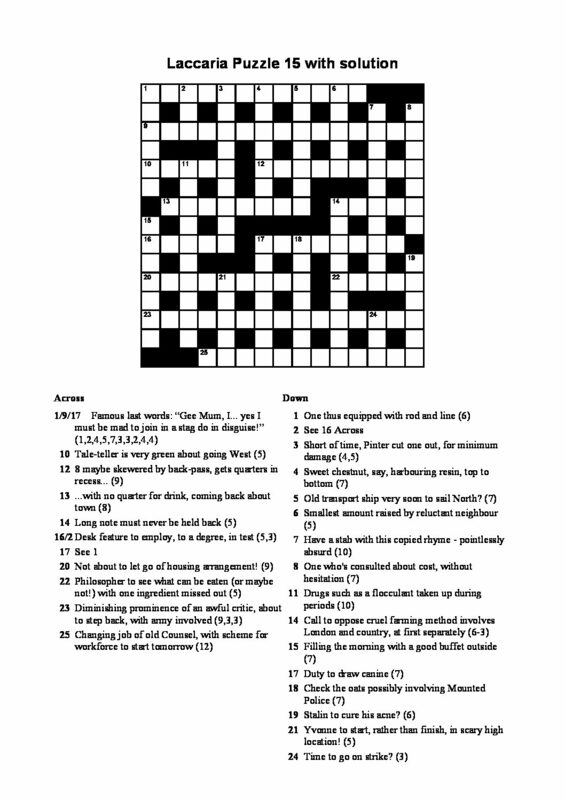 This is my first contribution to the 1across site, although not my first puzzle elsewhere (I have sent efforts to Big Dave and Alberich, as well as others which I’ve kept mostly to myself). Whatever you make of the rest of the puzzle, I hope you have as much fun with the ‘long one’ as I had in setting it! Quite a struggle! It also took quite a lot of work to find a grid suitable to accommodate it – in the end I had to construct my own, not something I’ve done before. My aim was to fit the long one into as few lights as possible, because I think puzzles ‘look better’ that way. Since it has 35 letters, it needed at least three lights, and in the end I just about managed that. I believe the custom here is to post up the solution a few days later. So I’ll do that. Hello Laccaria, welcome to the site! I am relatively new to this as well…it looks like we are revolving in similar circles! I have completed your puzzle today. I thought the level of difficulty was just about right for me (I think I’m a sound solver but not ‘expert’). Took me around two hours on and off (I broke halfway through to mow the lawn in the searing heat of the afternoon sun…it would have been a shame to leave it until the evening when it was cooler and actually pleasant). I liked the grid. I’m trying to get the hang of self-design. Anax’s piece on BD’s site is helpful…have you seen it? My ticks went to 5d, 6d, 17d ( I thought there may have been a mini-theme with 15d…but it is probably nothing) and 10a. Your ‘mega-gram’ I got without the grind…after 1d and 2d were solved, it just jumped out at me. Well done for fitting it in, though. – 12a I can’t parse…could you explain? All-in-all I really enjoyed this so ‘thank you’ for uploading it and I look forward to your next. Many thanks Wire for your post, kind words and generous assessment. Much appreciated! I like to think, I get better the more I practice at this. I didn’t actually design the grid entirely from scratch – I’m no good at that either. I’ve also been on Boatman’s class, so I know a bit about what constitutes a ‘good’ grid and what a ‘bad’ one. I am also fully aware that grids with lights-on-edges (like this one) are more solver-friendly, whereas grids with ends-on-edges are more setter-friendly. Obviously when in my setter’s hat I prefer the latter! I’m glad I managed one of the former kind, this time. My objective, of course, was to get the long one into 12, 15 and 8-letter lights, all across, and I managed that after a lot of searching around. I went through all my library of grids: the ones supplied with Crossword-Compiler, the Guardian set (provided by Boatman), and a number culled from old Independent puzzles – and couldn’t find one that fitted. In the end I took one of them (one of the Independent ones I think, can’t quite remember) and twisted, chopped and changed it about until I had what I wanted. I’ve answered some of your comments about the clues, but because my answers might constitute a spoiler for others coming along to try out this puzzle, I’m posting them as an attachment. Anyone else – you have been warned! Hamish, thanks. I think the problem for some solvers is, they get ‘withdrawal symptoms’ if they don’t get their fix of ‘check’ and ‘reveal’ buttons. These are of course provided on the Guardian’s own cryptic page (except for the Prize) and also on Big Dave – but not on Alberich and not on this site – obviously not possible if uploaded as a PDF. Speaking for myself, I do my best to avoid such buttons, leastways not until I’ve either solved or am a long way into a puzzle! 🙂 But each to themself – everyone’s different! Anyway, in an attempt to alleviate this situation, I’ve just checked to see if the web space allotted to me when I first bought Crossword-compiler, is still there. Apparently it is, so see here for an interactive version of the above puzzle! Ah! I’m a ‘do it on paper’ boy – I don’t get on with apps for crosswords. Strange, because I’m an über-geek when it comes to most other things! If I didn’t already know Laccaria from exchanges on other websites I would not have adopted such a facetious tone in putting up what amounts to a request for the solution to be made available in accordance with his stated intention. Of course it’s up to Laccaria if and when he chooses to make the solution available, but — as he already knows, and as I have said elsewhere on this site — I personally don’t start a puzzle until I know I will be able to see the solution, because if I get completely stuck I don’t want to be left frustrated for an indeterminate period while I wait for the solution. It’s not a matter of looking at the puzzle then straight away the solution to critique it: I wouldn’t want to see the solution till I’d had a fair crack at it anyway. In fact, I would be annoyed if the solution was made visible to me before I’d had a go at the puzzle. In the case of, say, a national paper, I will take it on trust that the solution will be published on a specified date, but with individuals I prefer to have it available in sealed form before I start. I’m not bothered about reveal buttons and so on; I also prefer to do puzzles on paper. Regarding spoilers, my own policy is not to read comments which may contain them until I’ve tried the puzzle myself. In this case I have the comments ready and waiting in my feed to be read once I’ve tried the puzzle myself. Of course, I see the first line of the comment, which is how I’m able to make this response while avoiding for the time being seeing any discussion of the meat of the puzzle. OK. I think Laccaria did as he said he would by posting the interactive puzzle with Check buttons (http://crossword.info/Laccaria/Laccaria_puzzle_15b – not sure if you saw it before), so the ‘if and when’ is is certainty and yesterday. We could argue the toss about what constitutes ‘a few days’, but I think that’s comprehensively off topic for here (I’m sure that there would be vigorous discussion if someone used a definition of ‘a few days’ for, say, a week, but let’s leave that to a comments page somewhere else!). I’d like to respectfully suggest that from here on we discuss the puzzle itself, rather than the ins and outs of how and when it’s been posted. Hoping to get to look at it myself tomorrow night, but it depends on how compliant my toddler is in going to bed. For those who prefer it on paper, full solution attached as a pdf. I have no further comments to make at this time. Thanks, Laccaria. I will give it a try … er… in a few days probably. I quite enjoyed this puzzle and slightly surprised myself (especially after your “difficult” warning) by completing it in one sitting over the course of an hour or two, although I did grind to a halt with three not entered (17d, 5d & 12a). I then took up Chambers Word Wizard to help fill the blanks and was nonplussed to find there were no words to fit 17d. This made me realise I had entered a wrong word at 25a, which also resolved my query about that clue. Word Wizard did help with 5d, when I kicked myself (but see below) and I then got 12 from crossers (but didn’t understand the tortuous parsing thereof). ***** WARNING! — SPOILERS AHEAD! I got lucky with the long anagram, because when I tried to think of any famous last words, those were the first that came to mind, so it was a write-in for me. The anagram was rather amusing, so credit for that, and I like the way 23 tied in, which could be a subliminal hint if someone didn’t get 1a easily. I wonder why you didn’t clue 17d with reference to that theme, too? 10a Thought at first I had an edge with this one, but no, Iago didn’t come into it and I only got it once I had the A and P.
12 This was too ‘clever’ by half and, like Wire, I couldn’t parse it. If you use complicated wordplay like this, I think you have to be careful to use very precise defintitions for the elements, so trying to extend the (admirable) deception of “8 maybe” by using rather oblique defs (“pass”, “quarters”) was a mistake imho. Personally, I would have been tempted to use “Broccoli” for “cubby” (Bond franchise producer). 13 This was very late in, got from crossers and def and I would like to see a reference for TILES = town. Are you thinking of “a night on the tiles”? Chambers has “… on the loose” for this and Oxford online doesn’t refer to town either. 14 I think “must” is surplus. 22 Even when I had all the crossers I couldn’t think of the philosopher until I realised “see”=LO and never really quite appreciated the eat/have thing till I read the crib sheet. I know it’s used all the time, but I don’t like LO=see. Looking and seeing are not the same, any more than listening and hearing or touching and feeling are. I think “what can be either eaten or had” would have got across your idea better and more succinctly. 23 Lovely definition but rather tortuous wordplay. I did think the surface wasn’t great, but then I imagined a couple of squaddies coming to my door and telling me to tone down my comments, so … great clue! 3d I didn’t like “minimum damage” much: “damage” is more “costs incurred” than “price demanded”, isn’t it? Maybe “prospective damage”? 5d I don’t think “very soon” for IN MO is good, because the expression is “in A mo”. That may seem picky, but it does make it difficult. I wrote a clue recently which used “in mess” rather than “in a mess” (to define CHAOTIC) and my test-solver didn’t like it but I still kept it until just before publication when I decided his advice was right and I subbed in a different (much better) clue. 11 Worst of the pack to my mind. Am I really supposed to know that alum is a flocculant, or even what either of those words mean? Best thing about this clue is that in looking up “flocculent” I was reminded of the marvellous ‘floccinaucinihilipilification’, which coincidentally describes my attitude to the clue. 15 I liked the deception in “buffet”. 18 “Mounted Police” was very good as, obviously, I was immediately looking to get MP in. Not sure “oats” was much of hint: I never even noticed the homphonic ref to 1a. 19 I thought the QM was for the CD and felt you needed a separate DBE indicator for Stalin. “Say Stalin’s to treat acne?” would work better, imho, but still a silly surface, not quite compensated for by the humour. 21 Not too keen on “to start” meaning “to start with”. Maybe better as “Yvonne’s start, not finish, in scary high location”, I think, even if the surface is not quite so good. The “!” isn’t necessary and rather smacks of “Aren’t I clever?!”. 24 Very good, though if I hadn’t already got 25a (albeit wrong at the start), I would have confidently entered OUT. It took me a long while to get (and before I got it reinforced my doubts about REEMPLOYMENT though the problem wasn’t in that area), due to the deceptive split and tricky “strike” as 2nd def. Cheers, Laccaria. Definitely the best I’ve tried of yours. Keep improving! Thanks WN. I appreciate your taking the trouble over this one (blogging someone else’s puzzle – even after you’ve solved it – is no easy task, I know it!) And I’ll overlook the somewhat slighting comments upthread, except to make these points: (1) don’t try to ‘rush’ a contributor into putting up the solution. Trust me – I knew I’d get round to it in time! As it happens, I’ve been in private touch with one or two other people who told me they’d have a go some time – though they haven’t yet posted on this forum – I was giving them time. And (2) whatever happens, or happened, on fifteensquared.net, is irrelevant. Suffice to say, I’m still visiting that site in read-only mode only – the ‘official’ blogs are invaluable especially when I’ve failed to parse something in the Grauniad crypto! As to the Mad Hatter’s Tea Party that the below-the-line comments sometimes descend to, I’ll leave that to those who really enjoy that sort of thing. My skin’s not thick enough! Back to the puzzle. I’m not going to go through your comments clue-by-clue here, but I’ll take note of all that you’ve said – very useful! When it comes to 12a, this is actually a word that I clued – rather poorly and amateurishly – in one of my earlier attempts at setting. I was determined to do better this time around – and for me, “do better” means “make it really fiendish, just so long as the grammar works!”. I think it does. As I said before, the answer to 8d was a real gift here! As to 17d and themes, I should explain that after I’d laid down the ‘long one’, I felt it needed some supporting material, and I had another 15-letter light which I didn’t want to waste! Hence 23a, which was a devil to clue! 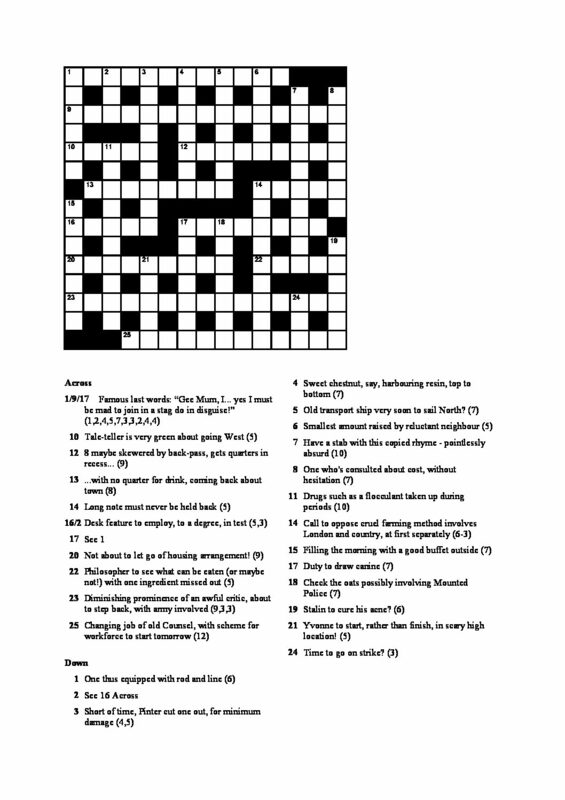 That’s as near as I got to an ‘official’ theme – I really didn’t mean 17d to get anywhere near the theme, it’s just a word that Crossword-compiler’s “autofill” helpfully inserted for me. Enough of me rambling on. Cheers. L.
This reply was modified 10 months, 2 weeks ago by Laccaria. I was going to add something also about 11d last night, but the Land of Nod was beckoning rather forcefully! Clearly not a popular clue for some! My line of reasoning is – there’s always going to be the odd clue of the “Write-in first, parse later” type (it happens to me all the time when I’m trying to solve something really nasty in the Graun!) I think my definition was perfectly clear and the solution word is after all commonplace. As to my rather abstrusely referring to “flocculant” – I rather expected that people would be diving into Wikipedia as soon as they’d seen what they were about! After all, that’s exactly what I’d have done if it had been someone else’s puzzle and I was trying to solve it! If this makes it a “no-like-um”, sorry! I rather dislike 3-letter lights, unless they’re an integral part of a theme: mainly because of the “one-unch-only” rule for such lights, which means they’re rather a giveaway – after all even if you haven’t the foggiest, you never have more than 26 possible look-ups! (25 if you discount the Q). Note that I don’t subscribe to the “at-least-50%-crossers” rule (The Times?) for longer words – viz. 8d and 15d. I hope I haven’t made too many solvers unhappy! So I was happy to only have two 3-letters to deal with, in this grid. And even happier when I sussed out a way to combine 2d with another light. So that left only 24d. I did my best, and was happy with the result, especially the surface. Glad you liked it! Thanks for the response, Laccaria.I hope my remarks didn’t seem too harsh or patronising. I have seen you apparently offering tips to the likes of Arachne, so I don’t feel too bad about the latter. At the risk of annoying Hamish by returning to the question of solution-posting, I would say that a sealed solution document isn’t a spoiler, so can be posted at the same time as the puzzle. Also, it’s a bit of a faff having to download a separate doc to read your reply to comments. Surely a clear spoiler alert is sufficient? One can’t really give effective feedback (or reply to it) without some risk of spoiling. Also some potential spoilers in comments would be avoided if your parsing notes were available to those who remained puzzled after solving. Not sure what happened on 15^2 or how it’s relevant. I remember one poster was rather rude about the length of your comments recently. Did the army get involved (see 23)? If you’re not fussy about checked/unchecked ratios, perhaps you will like my new one, which Alberich assures me will go up on his site this week?